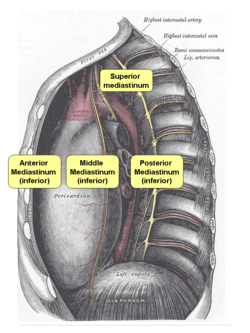 UPDATED: The mediastinum is the median region of the thorax, usually described as the "space"1 between the lungs. This region is divided into a superior and inferior mediastinum by a plane that pases through the sternal angle or Angle of Louis. • Posterior mediastinum: Contains the descending aorta, the azygos and hemiazygos veins, the esophagus, and thoracic duct. 1. Personally, I do not use the description of the mediastinum as a "the space beween the lungs", as it conjures the image of literal "open spaces" around or between the organs. The fact is that the mediastinum is tightly packed with no spaces between the organs. This is why I prefer the definition of the mediastinum as an "area" or "region" between the lungs. Dr. Miranda.